Ten degrees below zero – the recorded low at the Eugene Airport early Sunday morning. I knew it was going to be cold, but wasn’t expecting the second coldest day ever recorded in the Willamette Valley! No wonder I was lacking the motivation to get out of my warm bed and hit the road. Nevertheless, after a warm shower and extra time to warm up the car, I headed out. My car’s thermometer registered one below when I left my house, but the forecast temperature inversion didn’t disappoint, and it was a toasty 8 degrees a few miles east of Sweet Home. 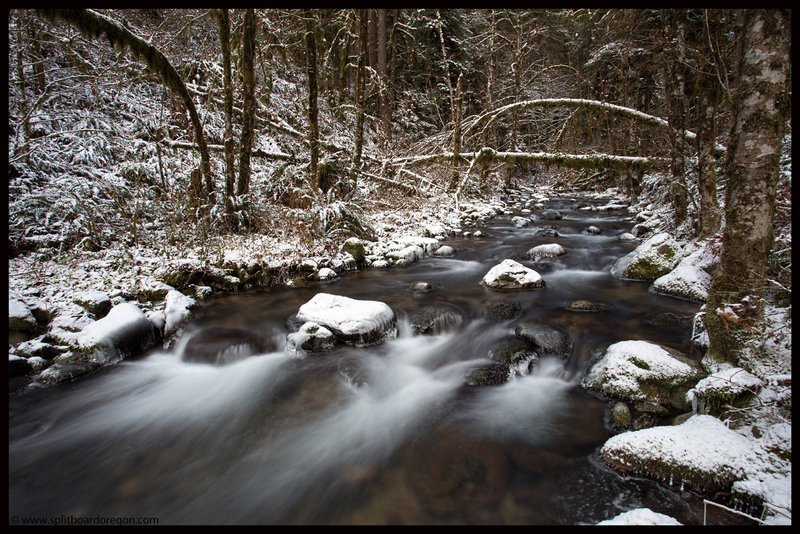 Given the cold temps and recent valley snowfall, I decided to stop along the way and snap a few pictures of the local streams. 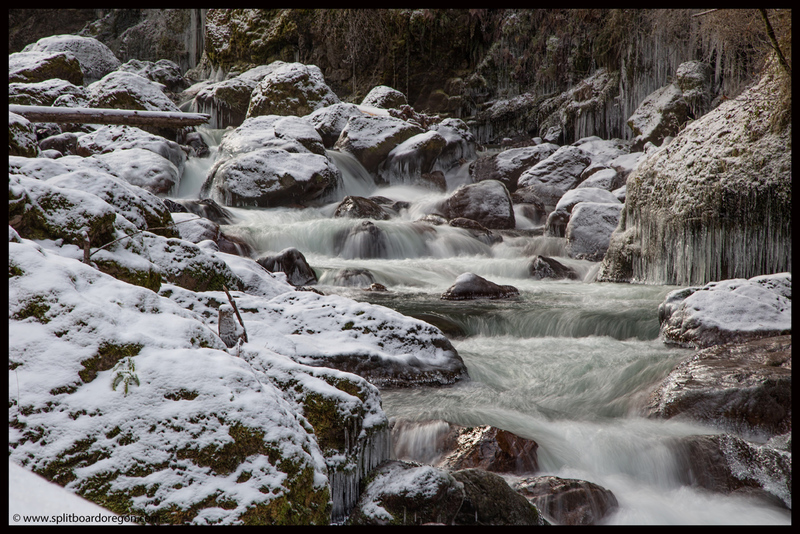 First stop was at Trout Creek…. 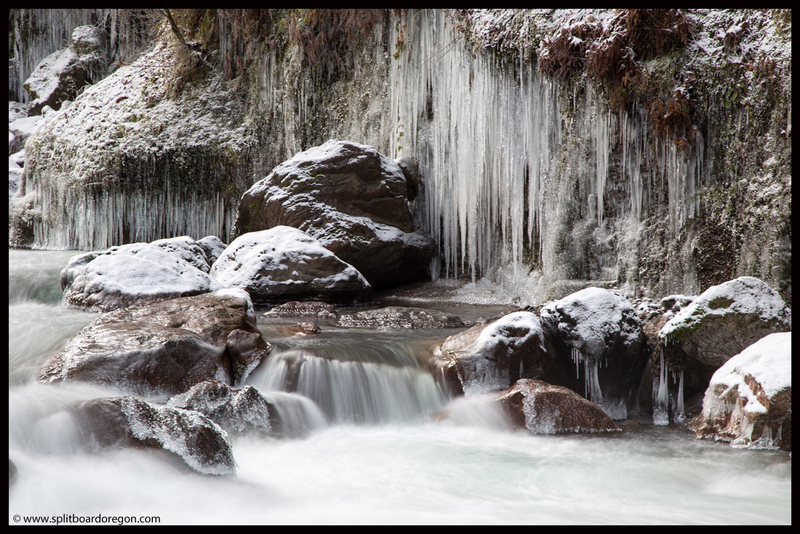 A few miles further down the road, I stopped to photograph one of my favorite spots on the South Santiam river. Getting down to the river proved to be a bit difficult, as the last few feet were completely covered in ice. A few slips and slides later, I made it into position to start shooting. The river had a definite cold look to it, and was actually flowing a bit of ice. Briefly however, the sun partially peeked out from behind a cloud and I snapped the below shot which actually has a bit of warmth to it. By 9:45, the light was starting to get too bright for good photos, and my fingers were getting cold, so I packed up the camera gear and headed to the car. A few minutes later, I found myself in the Hoodoo parking lot looking at the hill. Conditions weren’t epic, but it looked like I could link turns from the top to bottom. One other car was in the parking lot, and I exchanged a hello with the folks sitting in it. 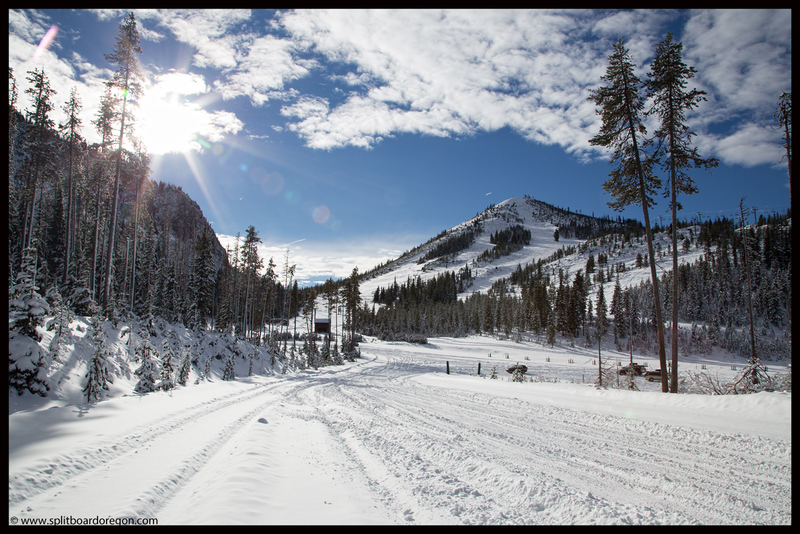 While I was getting my gear in order and applying skins to my board, a state cop pulled in and advised me to be careful if I was heading up to ski, because “nobody is around today.” I politely said I would, all the while thinking, yeah, nobody’s around – that’s the point! 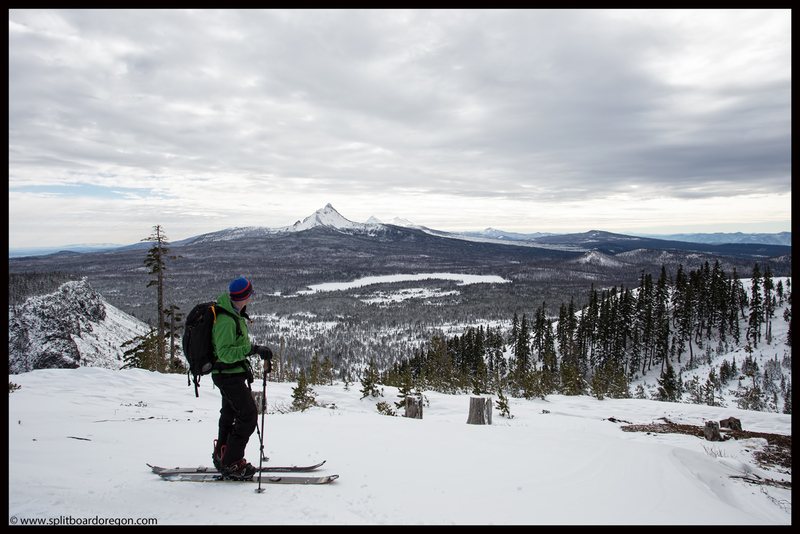 When I hit the snow, I could tell it was cold, as my skins really didn’t give much glide across the snow. Nevertheless, the snow was light and felt like it would ride nice. 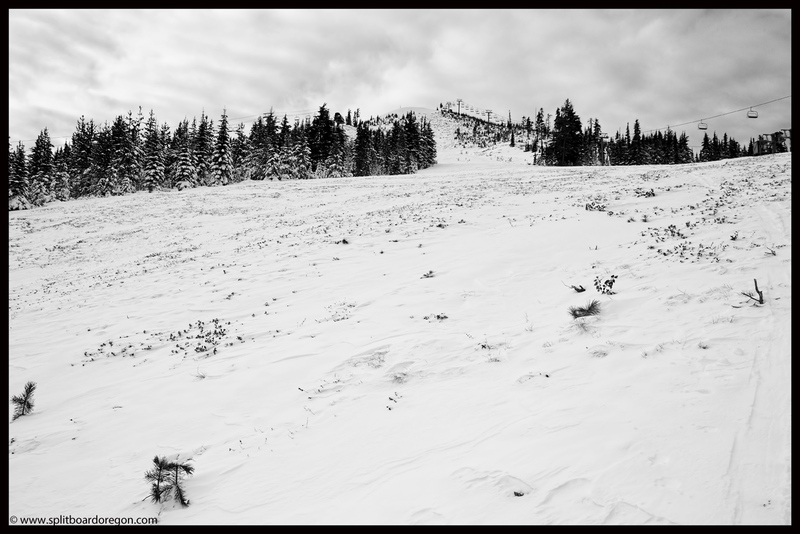 It had been windy however, and the slope was windblown in some areas…..
Below Ed’s Chair, conditions were prime for riding, and I considered stopping and stripping the skins right there, but pushed on for the top to get the views. Above Ed’s Chair, the snow was extremely wind affected. 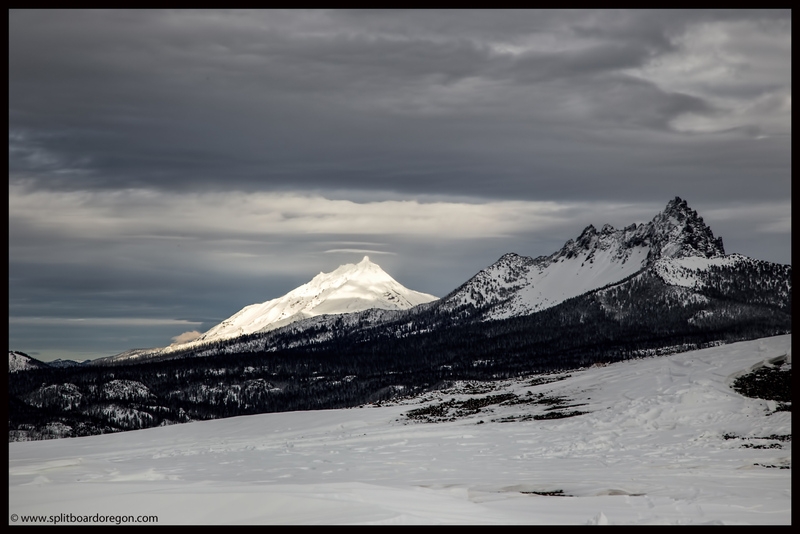 It took an extra 15 minutes longer than it should have to get to the top, but once there, the views north to Mt Jefferson and Three Fingered Jack justified the effort….. I hung out on top for a bit, soaking in the views. To the southeast, the Sisters were coated in white, with the blueish tint of winter showing through. Before heading down, I grabbed my tripod and snapped a few self portraits, including the photo below with me, Big Lake & Mt Washington….. Soon, the wind picked up and that was my cue to head down. The turns off the top were a mix of wind slab and ice, depending on which side of the ridge I was on, and pretty much sucked. From Ed’s Chair down though, the powder was light and fast. I made smooth pow turns back down to the base area and headed back up for another lap. At the top of Ed’s Chair again, I chatted with a couple I met the previous run, John and Anna from Corvallis, and exchanged a few stories about backcountry turns. Run number two was equal to run one, and even though the snow depth was minimal, I didn’t find any obstacles. 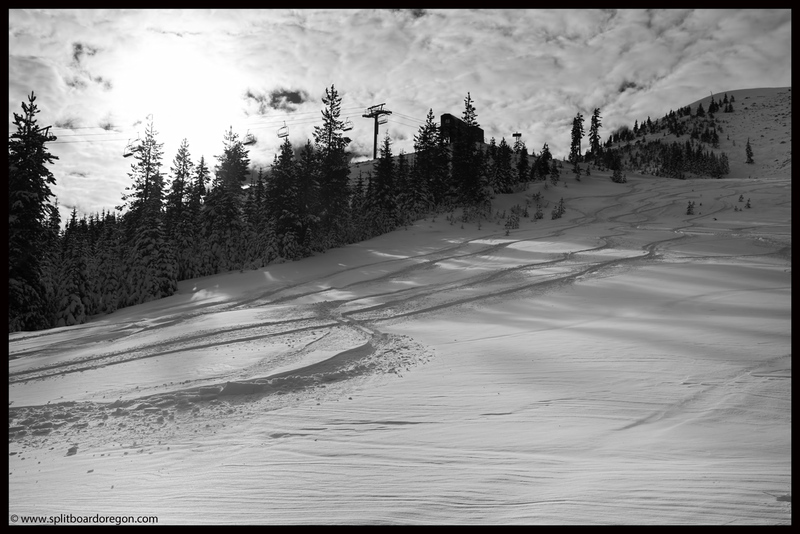 Here’s a shot looking back up at my tracks along with a few others….. I thought about making a few more laps, but elected to get an early start on the drive home, given the cold conditions and the fact that I preferred to make the drive in the daylight given the conditions. On the drive out, the sun came out for the first time since the morning, so I stopped and snapped a photo of the hill…..
A few hours later, with several icy miles of roads behind me, I pulled into the driveway at my house. Staring at the 6 inches of snow in the yard, I found it kind of ironic that my house had nearly the same amount of snow as the mountains. This winter is definitely off to a slow start, but I’m hopeful the mountains will get hit with a few big dumps soon…..it’s beyond time!